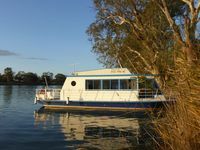 Property 2: "The Cube" Murray River - Sit on the deck and dip your toes in the water! Property 4: Edgecombe Estate - Room # 4 Great room with exclusive use of full bathroom. Boatel Cairns. Don't stay at the Marina.....Stay in it! Property 8: Boatel Cairns. Don't stay at the Marina.....Stay in it! Property 13: Boats and Bedzzz "The Murray Dream"
How about wake up in a million dollar boat? Property 15: How about wake up in a million dollar boat? Older houseboat but has the basic comforts. Would benefit from an upgrade (larger tv, newer kitchen utensils, clean bbq) to improve the experience. Loved the water views and canoes to paddle.